This page contains guidance and links to related course materials. Each step of the course builds upon itself in order to provide a sequential system of teaching. This allows the student and teacher to track the student’s improvement along the way. 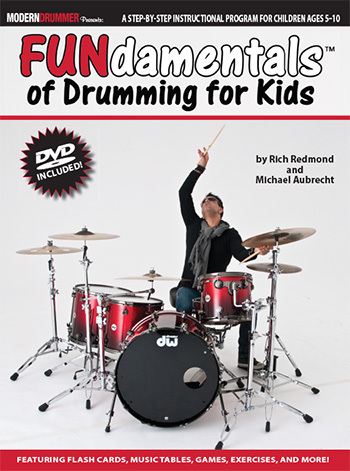 This course is based on the instructional book/DVD FUNdamentals of Drumming for Kids. It is assumed that the instructor has already purchased this book as it is required for this course. 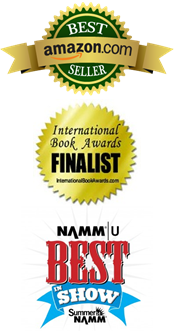 You may purchase the book directly from the publisher Modern Drummer or online at Amazon.com. It is recommended that the instructor purchase two copies, one for the student and one for the teacher. This will allow both participants to write in and conduct the cutting and coloring exercises. This syllabus presents exclusive training aides and excerpts from the book. It is recommended that the instructor utilize the entire publication for maximum results. These six steps are meant to enhance the experience. Step One: Video of Course Philosophy: This video provides the instructor with a general idea of how the course was developed and how it is executed: FUNdamentals Philosophy Overview. You can also view this video with your student to get him/her acclimated. Step Two: Book Introduction: This step occurs when the instructor introduces the student to their book. Flip through the contents and briefly inform the student of what is to come. You can also use the Teaching Aid that is linked online as a PDF: A Step By Step Introduction for the Classroom. Step Three: Inspire the Student: Watch this entire section of the book titled Going Global, incorporating annotated music followed by the accompanying video. This will lay the foundation for what is to come. Inform the student that this is what the end result will be. This will inspire them. Step Four: Motivate the Student: Even though the book progresses from hand drumming to drum set allow the students to hold a pair of drumsticks. Allow them to beat on a surface be it a pad or drum. This will stimulate the student to want to take lessons. You may want to make time at the end of your lesson to allow the student to bang things. Step Five: Book and DVD: Begin the course as outlined in the book. The sequence has been designed to build upon itself. Encourage the student to take notes in their book and do the same. The material will evolve beyond the instructions into a more personalized experience for student and teacher. Not all sections are corresponded on the DVD. That is reserved for the exercises. When you reach those sections open the book to the music annotation and watch the DVD. Step Six: Homework: Weekly assignments are at the discretion of the teacher. You can recommend that the child re-read what was covered that day. You can also develop your own exercises to expand upon what is covered in the book. There is a Bonus Lesson with Andre: Four Way Independence on the DVD presenting a lesson with the host and a student. Watch the section together and ask your student to share their thoughts on the video. Feedback: We would love to receive feedback from instructors and students. Let us know what worked, what didn’t, and how we can improve upon the course. The book is currently in its third printing and we are very grateful for the success of the book. That said, we can always improve and your responses will help us tremendously. They may even end up as part of this course! To stay in touch with what is going on with the book to include bonus features and events, go to the FUNdamentals Facebook page. 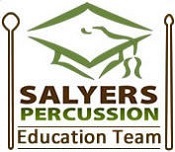 You can also visit this blog Off Beat for course-related posts.